Disconnect radiator hose (lower) from water inlet side. Refer to CO-15, "Exploded View". Remove water inlet bolts, then remove water inlet and thermostat. Place a thread (A) so that it is caught in the valves of the thermostat (1). Immerse fully in a container (B) filled with water. Heat while stirring. The valve opening temperature is the temperature at which the valve opens and the thermostat falls from the thread. Continue heating. Check the full-open lift amount. The full-open lift amount standard temperature for the thermostat is the reference value. After checking the full-open lift amount, lower the water temperature and check the valve closing temperature. If valve setting at measured values are out of standard range, replace thermostat. 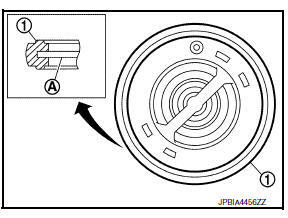 Install the thermostat with the whole circumference of the flange (A) fitting securely inside the rubber ring (1). Do not reuse rubber ring. Install the thermostat (2) into the thermostat housing (1) with the jiggle valve (A) facing upwards. The position deviation may be within the range of В±10В°. Remove the generator. Refer to CHG-29, "Removal and Installation". Partially remove the fender protector (LH). Refer to EXT-28, "FENDER PROTECTOR : Removal and Installation - Front Fender Protector". Remove the thermostat housing bolts, then remove the thermostat housing. Remove thermostat if necessary. Refer to CO-21, "Removal and Installation of Thermostat". 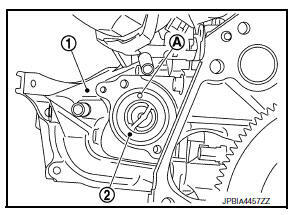 Remove water pump if necessary. Refer to CO-19, "Removal and Installation". After installation, refill engine coolant and check for leaks. Refer to CO-11, "System Inspection" and CO-12, "Changing Engine Coolant".